Editor’s note: This story has been updated to reflect a tweet from a Republican legislative leader. The nine-member Board of Elections and Ethics Enforcement will revert back Monday to five members appointed by the Governor if lawmakers don’t attempt a sixth time to restructure it. It has not yet been made clear what transition process will be in place, if any, and who the five members of the Board of Elections will be, and Gov. Roy Cooper’s Office has not returned three emails seeking comment about it. The State Board was not immediately available for comment. A three-judge Superior Court panel ruled the structure of the State Board unconstitutional. They wrote in a 2-1 opinion (along party lines) that the makeup of the State Board violates the separation of powers clause in the Constitution by diminishing the Governor’s control over the agency. The current structure of the Board, per the court, would expire at midnight Monday. Rep. David Lewis (R-Harnett) has said several times over the past two weeks that lawmakers are negotiating with the Governor’s office to come up with a new State Board structure, but that has not been confirmed by Cooper’s office. The nine-member current board is made up of four Republicans, four Democrats and an unaffiliated member. 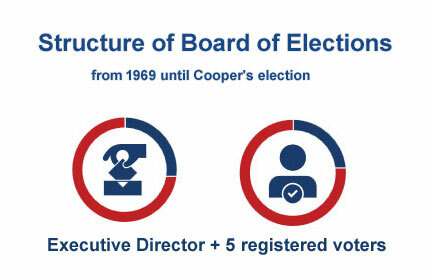 Eight members were appointed by Cooper from two lists of six individuals from the state Republican and Democratic Party chairs. That Board then appointed its ninth member. The previous structure, which will be law again Monday, allows for the Governor to appoint five members from two lists of five individuals nominated by the state Republican and Democratic Party chairs, so long as he does not appoint more than three individuals registered with the same political party. Each of those five members are to serve four-year terms, with no member serving more than two consecutive terms. That State Board is also different from the unconstitutional one because it is not charged with enforcing the state’s ethics laws. North Carolina Chief Deputy Attorney General Alexander McC. Peters signed a letter Thursday confirming that the Superior Court panel’s order ruling the current structure of the State Board unconstitutional meant that it would revert Monday to the prior five-member structure, which was in existence until late 2016. At issue all along also has been the legislature holding former Republican Gov. Pat McCrory’s appointment of State Board Executive Director Kim Westbrook Strach. Per the prior law, the appointed five-member State Board would appoint its Executive Director. County boards of elections will also revert to three members (not more than two from the same political party) appointed by the State Board. In the unconstitutional structure, county boards are made up of four members evenly split between the political parties. Lewis apparently disagrees that the prior law would kick in upon the unconstitutional law expiring. Read the DOJ’s opinion letter about State Board below.